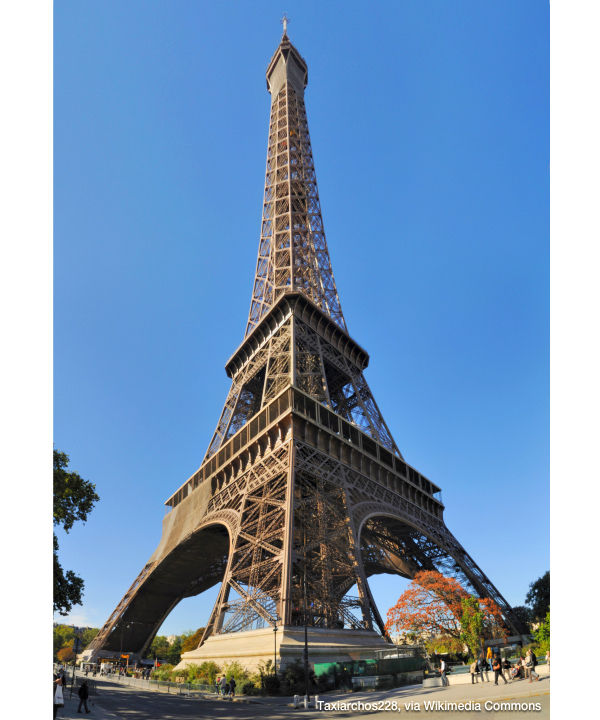 The famous Eiffel Tower in Paris points toward a surprisingly active gamma-ray sky. Fermi sees thousands of flaring supermassive black holes, hundreds of flashing neutron stars, scores of stellar explosions, along with the glowing path of the Milky Way. 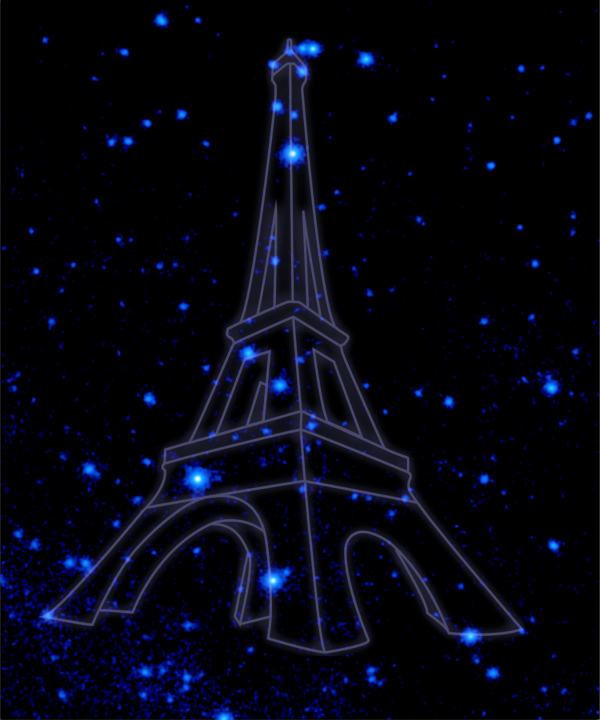 The Eiffel Tower constellation symbolizes the leading contributions of French scientists in detecting and understanding these sources. The gamma-ray sky, which is only visible above Earth's atmosphere, looks both familiar and alien. It is sprinkled with thousands of luminous dots, but they aren't stars — they're often distant galaxies powered by monster black holes. The glow of the Milky Way, the dusty central plane of our galaxy, is also apparent but looks unusually bright. And due to the way Fermi detects gamma rays, even distinct star-like sources are seen as blobs that often look as wide as a full Moon, about half a degree across. This limitation significantly complicates the task of disentangling point sources from the diffuse glow of the Milky Way. 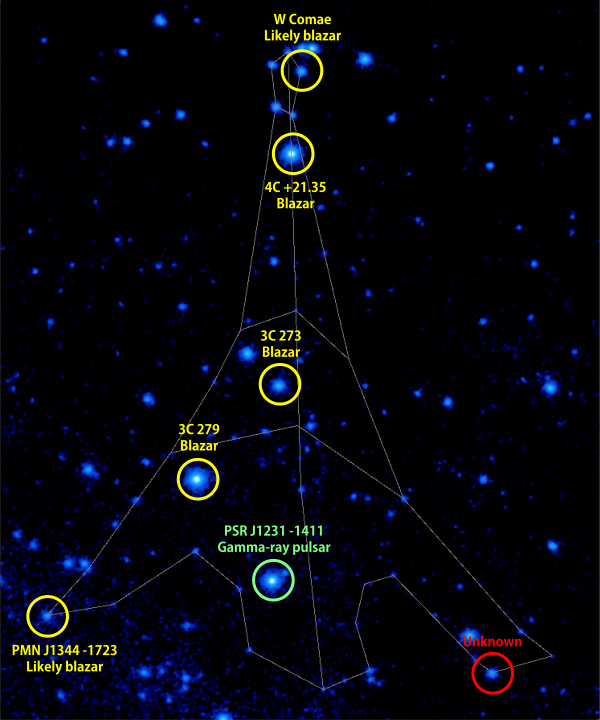 Nevertheless, scientists using Fermi's Large Area Telescope have isolated about 3,000 individual point sources in the gamma-ray sky. These objects rank among nature's most extreme particle accelerators. They include jets of particles launched by supermassive black holes at nearly the speed of light into extragalactic space, streams of electrical currents driven away from fast-spinning neutron stars, and shock waves caused by recent thermonuclear explosions called novae and the aftermath of more violent stellar explosions called supernovae. Fermi helps astronomers determine the detailed properties of the radiation coming from these extreme phenomena, revealing particle acceleration on scales and in circumstances scientists could not see before. These high-energy particles, called cosmic rays, cruise through our galaxy and through intergalactic space, scattering off magnetic fields in random directions. Cosmic rays emit gamma rays along their wandering paths as they encounter gas atoms and star light. This is how the plane of our own galaxy, the Milky Way, shines so brightly in the gamma-ray sky. The emission provides a unique view of two key aspects of galaxy evolution: the gas from which new stars will form and the population of near-light-speed particles that help heat, sculpt and drive its chemical evolution. The glow also tells scientists how cosmic rays are produced in regions where intense star formation occurs and helps them assess the importance of cosmic rays in the early development of galaxies and during galaxy mergers.